Average session duration and average time on page are two engagement metrics you see a lot in Google Analytics. And while they seem similar, they report completely different data. Which means how you use these metrics to understand content engagement is different too. Average Session Duration = The length of an average user session. Important note: A session is a group of user interactions with your website. For example, a user visits your homepage directly. They then click to your blog, read a few posts, and then leave. Session duration is the length of time a user spent performing those actions. Average Time On Page = The amount of time spent on a single page. Average session duration is a macro view of content engagement. It looks at how long visitors stay when they visit your site. Average time on page is a micro view. It looks at how visitors spend time on specific pages. Let’s start with average time on page. Optimize this metric by first analyzing which pieces of content generate higher than average time on page. Because your site is unique and in a specific industry, using internet averages won’t help you optimize. Instead, look at your content through a sizable time window, say a year perhaps. Then, use Google Analytics advanced filter features to home in on pages actually receiving consistent traffic. First, navigate to the advanced filter link. After clicking the advanced filter link, drop down the filter selection menu. For optimizing time on page, filter by pageviews. Because we want to see average time on page for site content that generates consistent visits. This eliminates any one-off’s. Set an appropriate page view threshold. You want to see pages consistently generating traffic. But you also don’t want to lose sight of your content. So, find the perfect balance. And on a side note – make sure the “include/exclude” and “greater than/less than” toggles are set correctly. From here, you’ll see your average time on page shift slightly. And this is a more accurate picture of time on page. Now to optimize time on page, look at what content is successful when it comes to keeping visitors on a page. Use this content as a template for future content. Session durations are a bit trickier to optimize. Because it requires a variety of content on your site to engage your visitors. So, how can you optimize this metric? 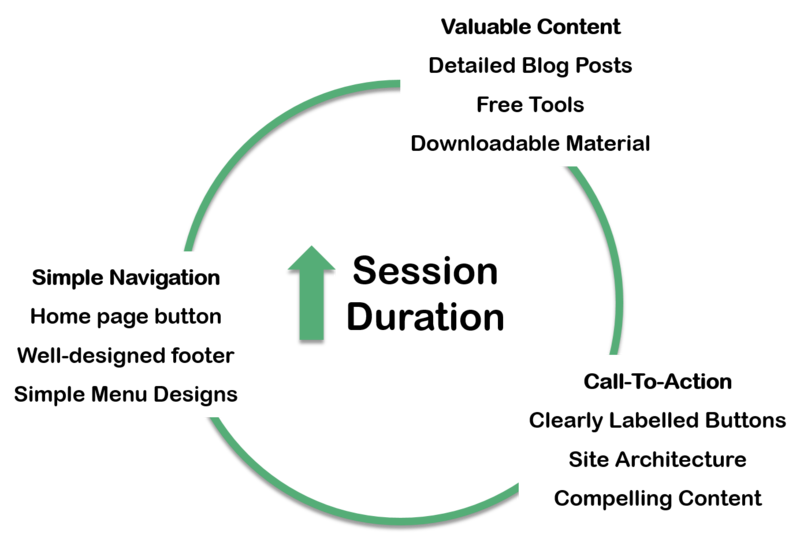 When you combine these features, you’ll begin to see session durations increase. You now have a better idea of two metrics that tell you if you’re keeping visitors interested. Now it’s time to start putting this data into action. Oh yeah – I talkin’ optimization here. The fun part. Use the techniques you learned here today and starting increasing engagement. Because engagement is why your site exists in the first place. And when it comes to your marketing program, it’s an indicator showing how well your strategy is working. If you liked these metrics, check out the content engagement metrics in Pagezii’s Blog Analysis Report. The report uses real Google Analytics data to show how engaged your readers are. 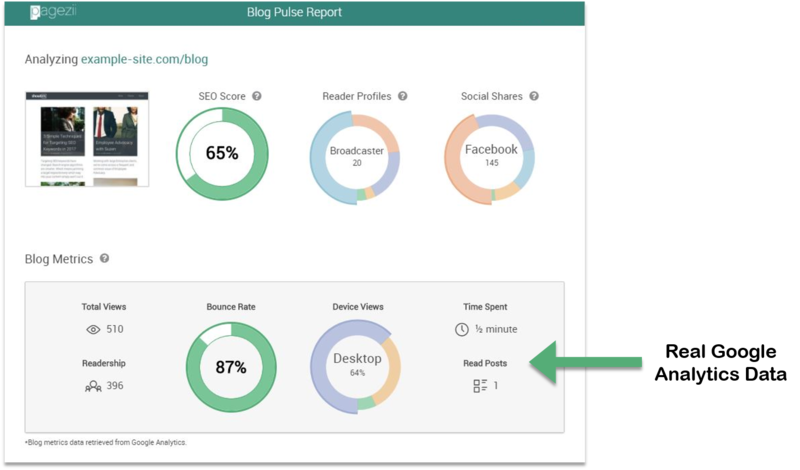 Give the Blog Report a test drive today and start optimizing engagement.